How's your hue perception? Here's a fun test to see how good your eye is. If you do badly, you can always blame your monitor! I scored an 8 out of 1409 (the perfect score is 0). But then again, I've taken Maggie Maggio's workshop that totally changed my approach to color. Maggie's normally over on the left coast, but she'll be in our area this winter giving her non-traditional Smashing Color workshop up in Vermont. Invaluable color skills regardless of your medium! That was cool...I scored Zero!! I guess that means my monitor is calibrated correctly? I loved this test. I was a 12. That being said, I'll take your suggestion and blame the monitor! That was fun! I got a zero. My Mac rocks! That was fun! I took it and scored a 15. . . must be the crappy monitor at work. . . heehee! I got an 11...must be the astigmatism. 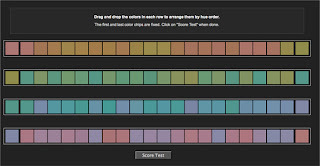 Haha...actually, I wasn't surprised by the colors it said I had difficulty discriminating between, because one of the ranges I had difficulty with totally made me dizzy just looking at it, and I had a hard time sorting it out!